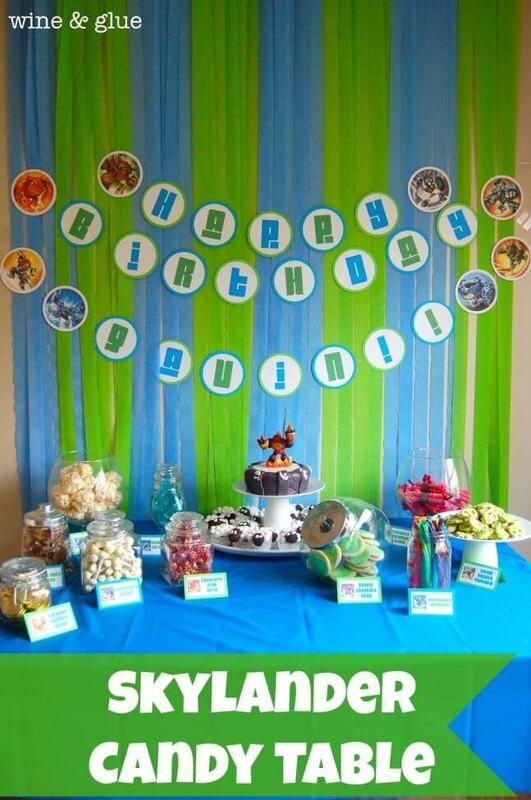 Planning a Skylanders birthday party? 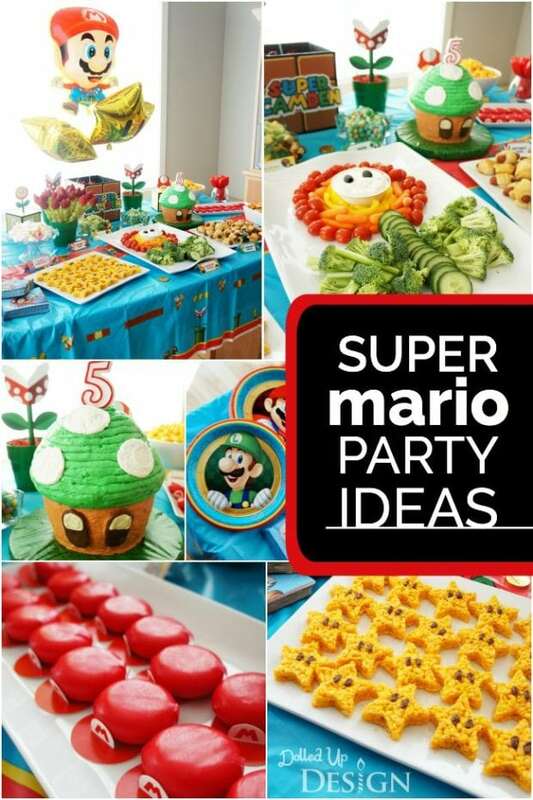 We’ve got you covered with these ideas for games, cakes and party supplies! These 17 Skylanders birthday party ideas don’t require the portal of power to activate. 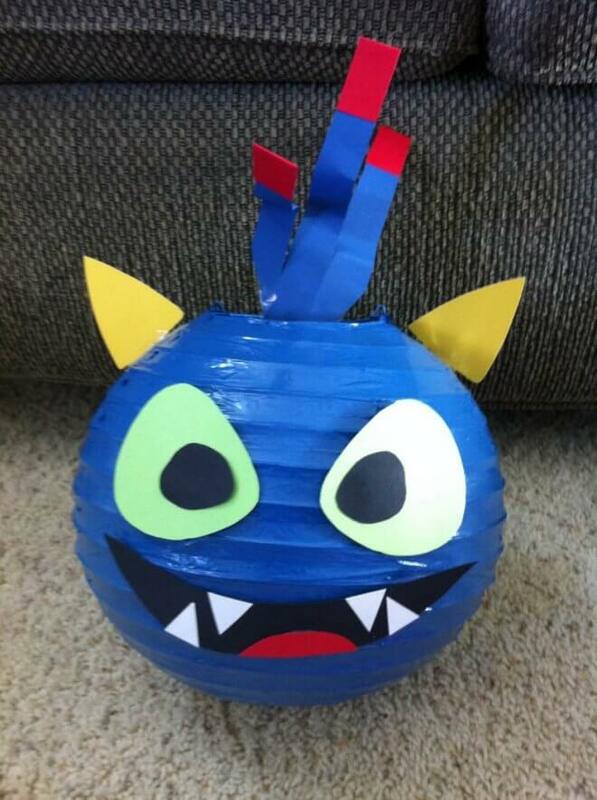 Read on to learn how to DIY Skylanders Chompy lanterns or Skylanders elements gumball favors. 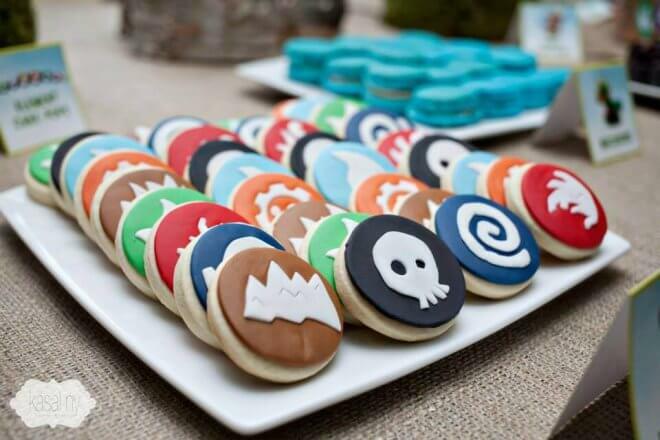 If you love to bake, check out the Skylanders cookies, cupcakes, and cake. 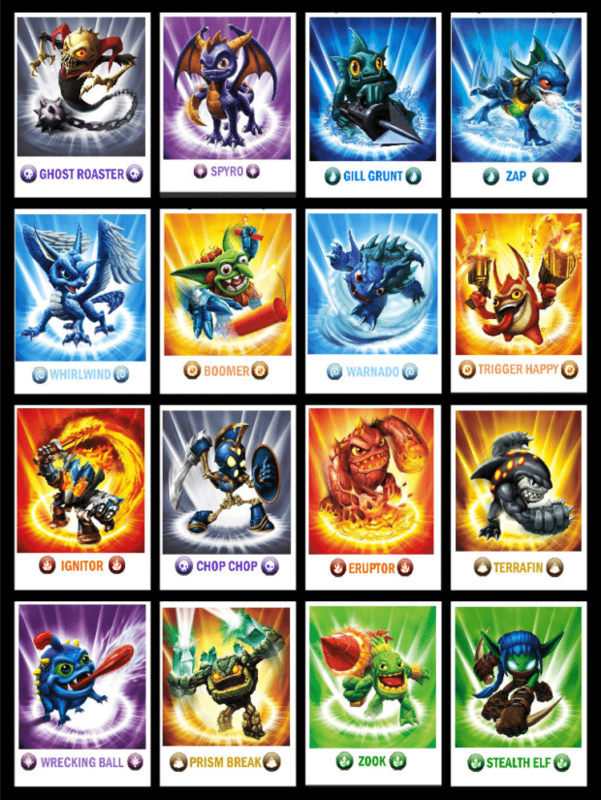 Plan for fun games, like Skylanders Bingo. Who wins? You do! Check out A Boy’s Space Invader Themed Birthday Party for a fun video game party. This Minecraft Themed Birthday Party is perfect for all Minecraft fans. Enjoy these Pokemon Go Birthday Party Ideas as you plan your event. Look at these fun Scooby Doo birthday party ideas for more inspiration. Get ready to get your craft on and DIY your own Skylanders Chompy lanterns—a great themed decoration for any Skylanders party. You may not know who or what a Chompy is, but your kids sure will! They will love seeing these green monsters that bark and yelp like dogs. You can create one or many, but you’ll need these supplies first: green paper lanterns, red & white felt, green pipe cleaner, plastic eyes, hot glue, and scissors. A little creativity in the kitchen with colored fondant can make a big impact on your Skylanders party table. You can make your own Skylanders cookies featuring the 8 elements from the game. These cookies may test your patience and skills with cutting fondant, but the resulting “oohs” and “aahs” from party guests will be worth the time and effort. 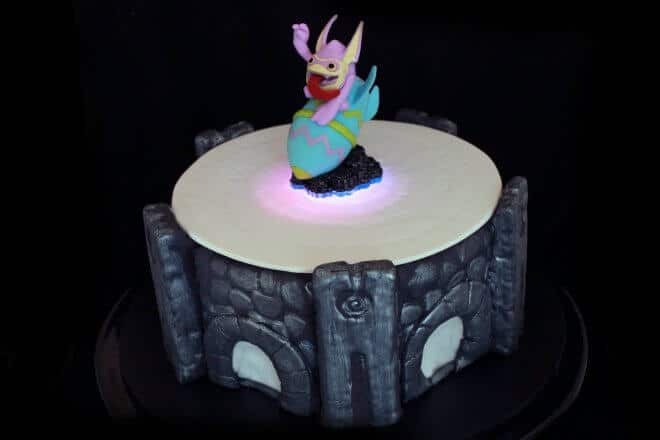 From a portal of power cake to awesome Skylanders themed invitation and party printables this Skylanders party is full of great party ideas including a Skylanders themed dessert table. The dessert table was full of awesome Skylanders inspired treats like smashed sheep cupcakes, Chompies truffles, prison break pretzels, elements sugar cookies and more. 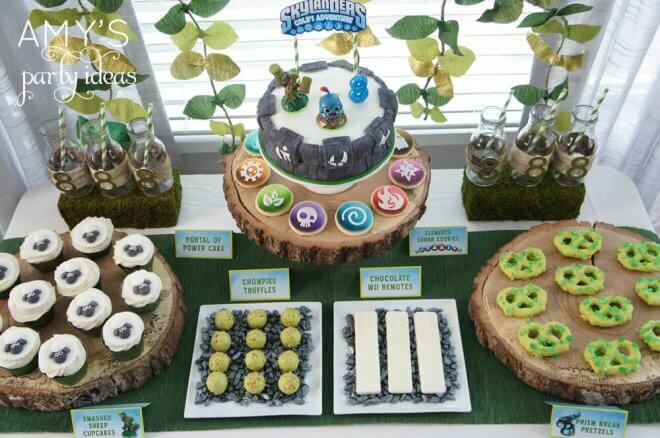 Get inspiration for your own Skylanders party dessert table. You’ll love the natural elements that tied the look together. You don’t have to be the top cupcake baker in the land to have rad Skylanders cupcakes at your boy’s next birthday party. If you aren’t good with a frosting bag, and don’t have skills for fondant, try using printable cupcake toppers. You can find printable cupcake labels to print and cut out to bring in the theme. Attach them to a sucker stick or toothpick for a great cupcake embellishment. 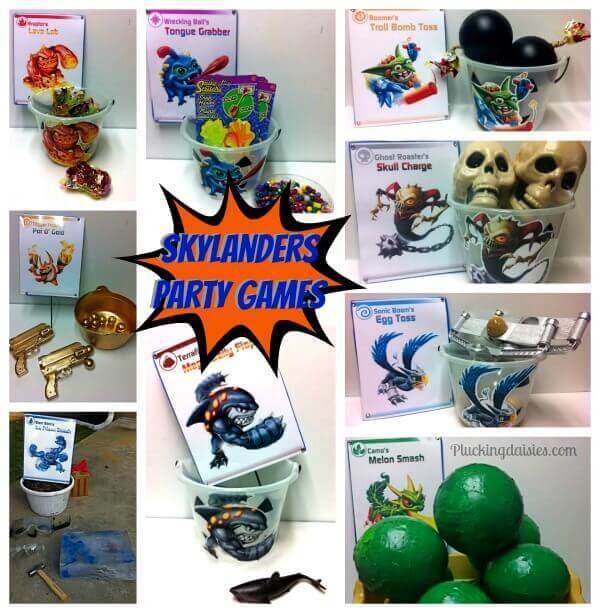 You can find a plethora of Skylanders Giants party game ideas here that will kick up the fun at your Skylanders party. Bonus—they are made mostly using dollar store finds, so they are totally affordable. Some of the fun game titles include Wrecking Ball’s Tongue Grabber, Sonic Boom’s Egg Toss, Camo’s Melon Smash, Trigger Happy’s Pot ‘O Gold, and Ghost Roaster’s Skull Charge. If you know anything about Skylanders, you know that in our world, Skylanders are frozen as toys, but with the use of the Portal of Power—a pedestal used to transport Skylanders into the world of Skylands—the Skylanders come to life. This tutorial shows you how to recreate the Portal of Power as a cake, complete with a light up pedestal. How cool is that? 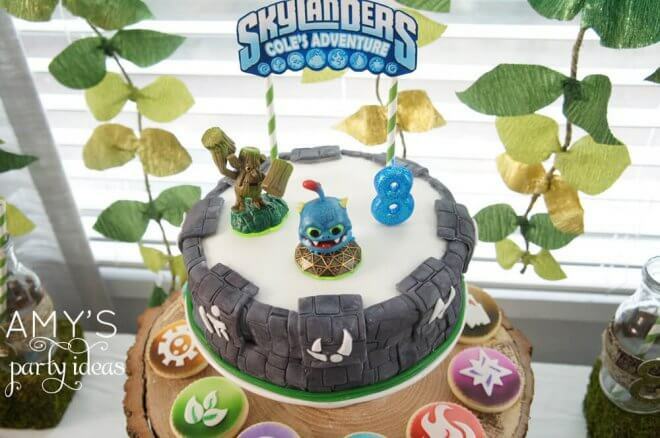 You are sure to amaze Skylanders party guests with this cake. Here’s another cook take on a Skylanders portal of power cake! Fondant was cut to look like stone! Real Skylanders characters were used as embellishments on top. A printable Skylanders sign was affixed to the cake using paper straws. 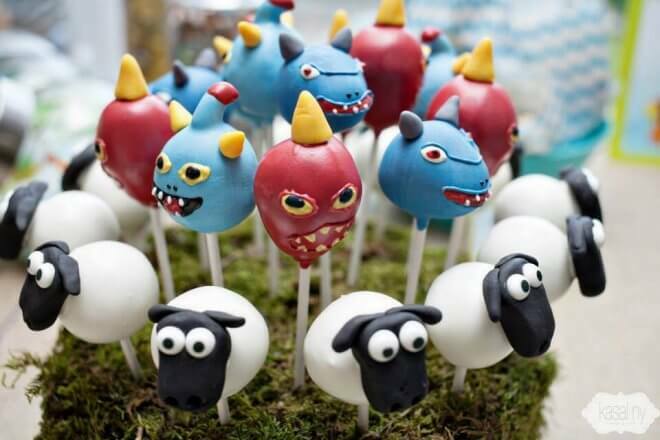 Even if you already have cake, and cupcakes at your Skylanders party, there is always room for cake pops. These Skylanders Giants cake pops are totally rad. They look just like characters from the game. Party guests will go crazy over them. Whether you bake and decorate your own or hire someone to make them for you, this idea will provide lots of great inspiration. Did you know you can upcycle Chinese paper lanterns by giving them a coat of spray paint? Now you know! 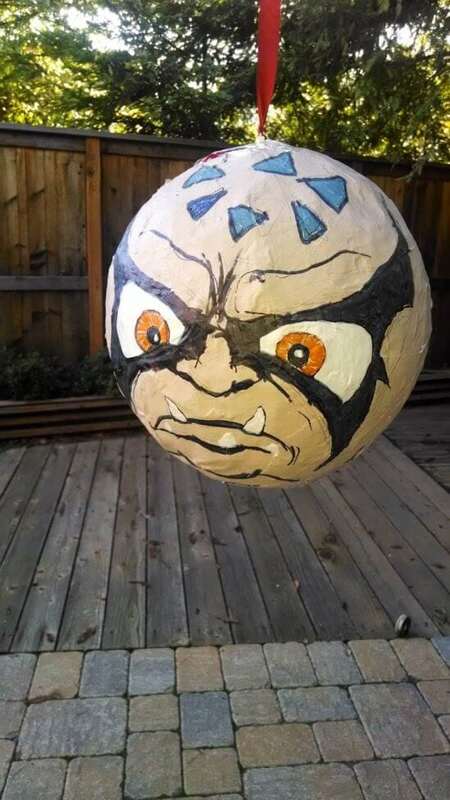 These DIY Skylanders character lanterns start with a Chinese lantern as the base for the face (either purchase the correct color or get bold and spray paint old lanterns to be the correct color. Various facial features are then cut from cardstock to resemble the different Skylanders characters. You can stop your search for the perfect Skylanders party game. This Skylanders bingo game is great for both large and small crowds. It’s especially cool because it features 5 Skylanders elements in place of the letters B-I-N-G-O. Various Skylanders characters fill the spaces. You can use mini marshmallows as game markers (or substitute cereal pieces, small candies, or even beans). Put together an out-of-this-world Skylander party candy table with tips, tricks, and ideas from this post. There are so many creative Skylanders inspired candy and treat ideas with clever names to coordinate with characters from the game. Here are just a few of the ideas: Chop Chop’s Bones, Prism Break’s Pretzels, Trigger Happy’s (Chocolate) Coins, Eruptor’s Fire Balls, and Double Trouble’s Orbs. DIY your own Skylanders party piñata for one exciting party activity. This piñata is made using a punching balloon covered in layers of torn newspaper dipped in a mixture of flour and water. After 4 layers of newspaper, a final layer of white copy paper was used as the final layer. Paint was added prior to hand-drawn details. The finished product is a Kaos (main villain) piñata, which the kids will love “defeating” using a piñata stick or bat. Send guests home with cool Mentos “elements” party favors! 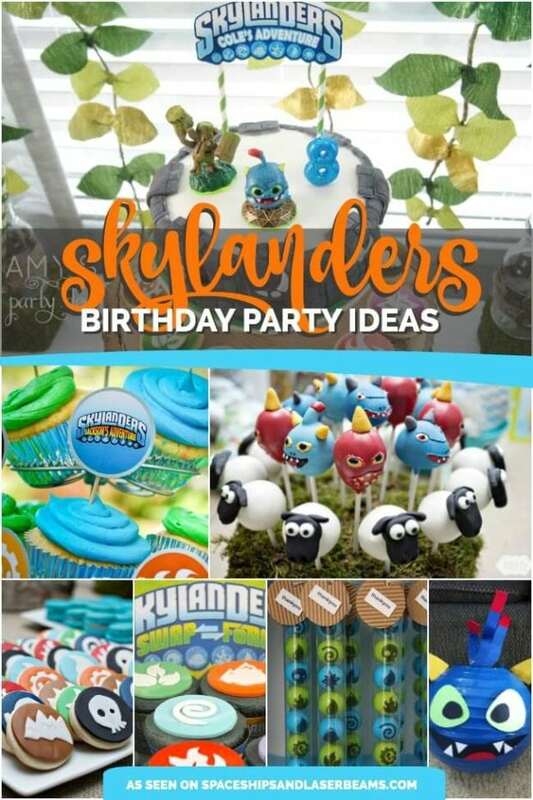 This link takes you to loads of Skylanders party ideas, including a free printable party favor label. Simply print the label, cut it to size, and adhere it to a tube of Mentos. Guests will love seeing the 8 elements featured on the label. Kids love anything custom that matches a party theme! 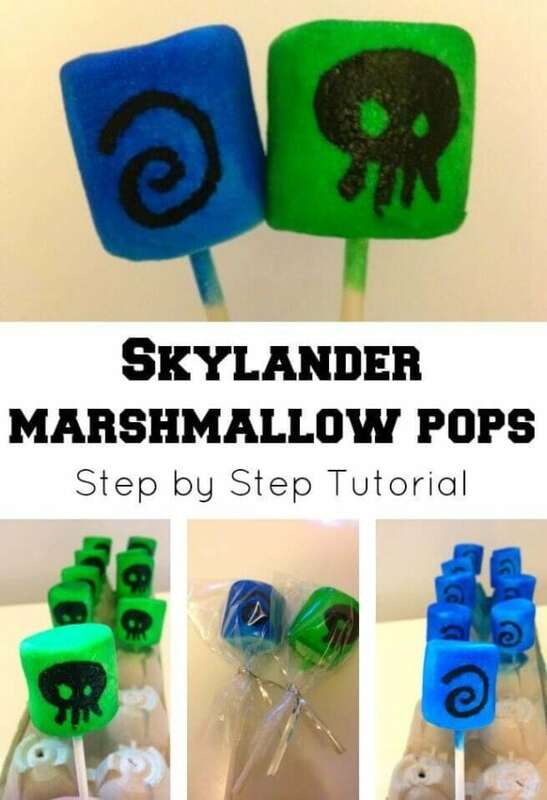 Recreate these Skylander marshmallow pops by following a simple tutorial. You’ll need the following supplies to get started: marshmallows, lollipop sticks, edible food spray (blue and green), and a black edible marker. Skylanders fans know all about smashed sheep from the video game. How surprised they’ll be to find them replicated on a Skylander’s themed dessert table. 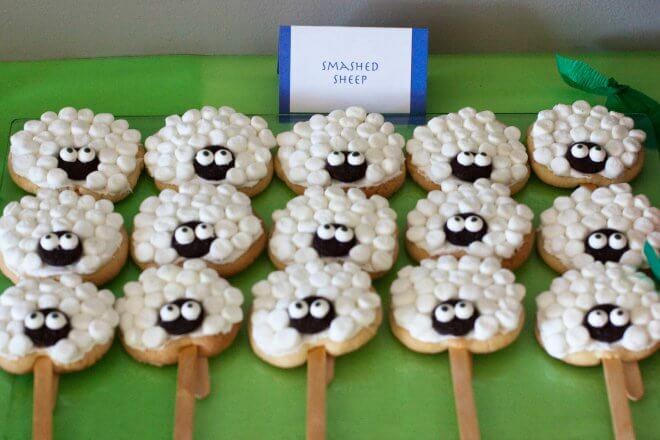 With the help of mini-marshmallows, candy eyes, candy melts, you can easily create your own smashed sheep on a stick. 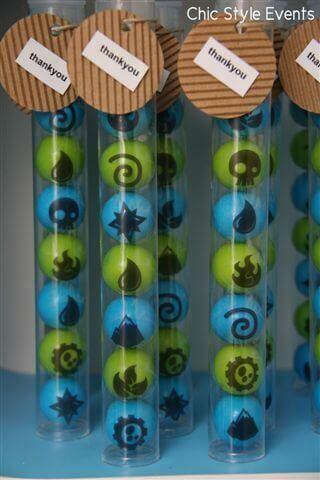 Send home a favor that all Skylanders fans will love—elements gumball favors. You can use an edible food marker to draw all 8 elements—air, earth, fire, life, magic, tech, undead, and water—on gumballs. 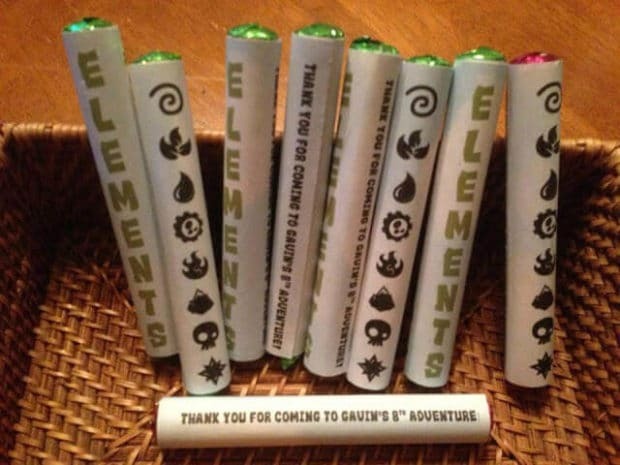 Slip the elements gumballs into candy/gumball tubes and attach a favor label. Guests will love thinking about the important role these elements play in the game as they eat each element gumball. 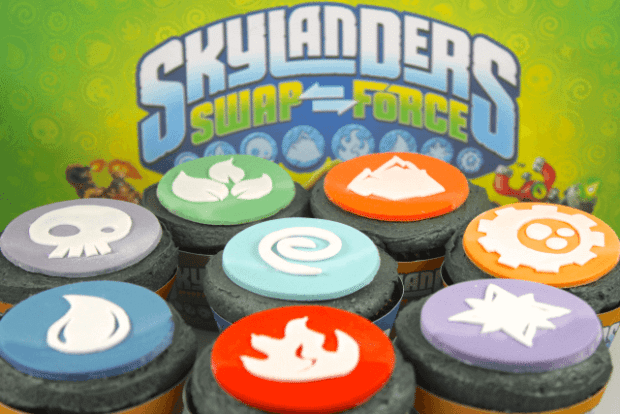 Any Skylanders fan can quickly identify the Skylanders SWAP Force elements, even if they are in cupcake form, since they are featured often in the game. 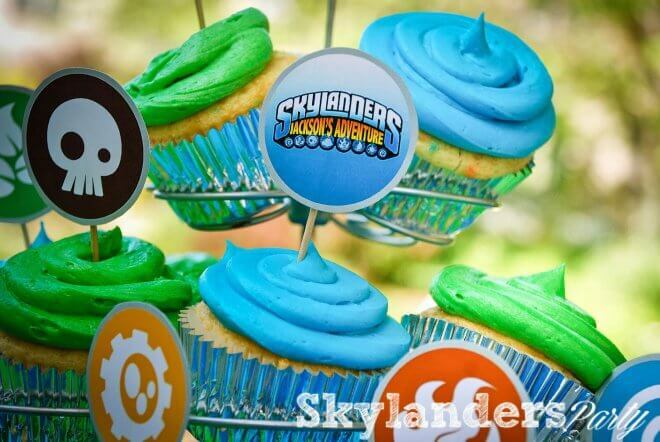 These Skylander cupcakes can be recreated following a simple instructional video. And the best part is, the fondant embellishments can be created several days ahead of time, saving you precious time on the day of the actual party.